Spacious 3 bedroom, 2 bath chalet-style home just 1 block from the most beautiful beach in northern Michigan--Empire Beach on Lake Michigan. Located in quaint, historical Empire, the home is in the middle of the Sleeping Bear Dunes National Lakeshore which recently was voted the No. 1 most beautiful place in America in a poll taken by Good Morning America. The home is 1/2 block from the heart of the village which includes restaurants, bank, post office, galleries, and public library. The interior of the home features an open floor plan with living room, dining area, kitchen, full bath, and master bedroom with queen size bed on the main level. The second level contains two large bedrooms, one with a queen size bed, and the other with queen size bed and two twin beds, and a full bath. The home has free wireless Internet access. 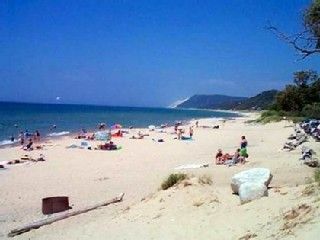 Empire is located in the heart of the Sleeping Bear Dunes National Lakeshore. In addition to swimming, hiking, and other outdoor activities, the National Park contains the Sleeping Bear Dune Climb, Pierce Stocking Scenic Drive, the Manitou Island Underwater Diving Preserve; North and South Manitou Islands, and the Empire Bluffs hiking trail. Bathroom 1 is located on the main floor. Bathroom 2 is located on the second floor. Newer home with open floor plan. The home has wireless internet access, washer-dryer, and barbeque. The Village of Empire is located on Lake Michigan in the middle of the Sleeping Bear Dunes National Lakeshore. It is a four season area with an abundance of festivals, art shows, and recreational activities.